What is the difference between the TTA and the TTA-2? Both procedures accomplish the same geometric alteration of the joint. The TTA-2 uses advanced planning and a sophisticated saw guide. The end result is fewer metal implants needed in the knee and less post operative swelling. 1. What is the Cranial Cruciate Ligament? The Cranial Cruciate Ligament, also sometimes called the Anterior Cruciate Ligament, is a tough band of tissue that connects the two main bones of the knee (stifle) joint. Specifically, the upper part of the joint is called the Femur and the lower part of the joint is called the Tibia. The Cranial Cruciate Ligament connects the posterior (rear area) of the lower Femur, to the anterior (front area) of the Tibia. This ligament helps prevent excessive motion between these two bones. Rupture of this ligament is the most common orthopedic injury in dogs and results in a painful, unstable joint. If left untreated, this injury leads to degenerative joint disease (arthritis). 2. Why did my dog rupture this ligament? Although this is the most common orthopedic injury in dogs, it is still not completely understood why this ligament ruptures. Many theories have been proposed. Certainly, trauma can cause the ligament to rupture - this is the most common reason for ligament rupture in humans. In dogs, however, this does not seem to be the most important cause. It is known that some dogs have excessive Tibial Plateau Angles (TPA), but research has shown that this, by itself, is not enough to cause the ligament to rupture. Some researchers think that under normal circumstances, the muscles of the knee joint are the main forces that control movements and that the cruciate ligaments are there as a safety factor to prevent excessive motion in certain directions. If there is a defect in this muscular control, as is postulated by these researchers, then the cruciate ligaments will be under more continuous stress than in a normal dog, which will lead to their deterioration. Indeed, most of the ruptured ligaments that we see are not sudden ruptures. Instead, they are partial ruptures that lead to full ruptures. In most cases when the joint is opened, even in a "fresh rupture", there is obvious evidence that there has been ongoing arthritis in the joint, indicating abnormal movement (and wear and tear) for a prolonged period of time. This previous deterioration is what ultimately leads to the final rupture of the cruciate ligament. 3. Why does my dog need surgery? Unfortunately, if your dog ruptures the Cranial Cruciate Ligament, surgery is the only real option. When the ligament is torn, there is a shearing force that results when your dog tries to bear weight on the leg. This shearing force makes the femur slide backwards on the surface of the tibial plateau. This abnormal movement sets up excessive wear and tear on the cartilage surface, which induces further arthritic change in the joint. Additionally, this abnormal motion frequently damages the cartilage pads in the joint, known as the menisci. Damaged menisci also leads to further arthritic change. Many dogs develop such severe arthritis that there leg is in constant pain. Pain is certainly not what we want for our pets! 4. Why do different surgeons recommend different procedures? For many years, various surgeons have proposed different procedures to repair a ruptured cranial cruciate ligament. Several procedures have fallen by the wayside as they have been shown to be inferior to newer procedures. As the researchers have analyzed follow up data, it has been shown that certain procedures are not as good as they initially were thought to be. This is a normal event in medicine (both human and veterinary). This does not mean that the surgeries proposed 20 years ago, or even 5 years ago, were wrong. It simply means that as good surgeons, we are constantly striving to present what we feel (at the time) to be the best alternatives available. 5. What surgeries are currently being done? At present, there are four surgical procedures being advocated. Lateral Suture Procedures, TPLO, TTA, and now the TTA-2. These will be discussed below. There is now a fifth procedure, called Ruby Joint Stabilization. Read more about that procedure on a separate tab. 6. What are the pros and cons of the Lateral Suture Procedure? There are many variations of the Lateral Suture Procedure, but they are basically all similar. They involve the placement of an artificial fiber on the outside of the joint to try to stabilize its abnormal motion. When done correctly, this procedure will frequently work in small breed dogs. This procedure is more likely to fail in the larger breed dogs. In this procedure, there is a tendancy to overtighten this artificial ligament to eliminate all of the excessive joint motion. In the process, there is often excessive joint compression, leading to damage to the cartilage and to a decrease in normal range of motion. Most people feel that these artificial ligaments all will break with time, so there real benefit may be to keep the leg in a forced rested position, while the dog's body builds up a sufficient amount of scar tissue around the joint, limiting its abnormal motion. While this procedure has been around for a long time, many surgeons are drifting away from this procedure to newer procedures. The TightRope Procedure is a variation of the Lateral Suture Procedure. The artificial ligament that is used is VERY strong, but it has the disadvantage of being a braided material. All braided materials have the unfortunate risk of harboring bacteria. If contamination occurs during the procedure, the resulting infection can be a major disaster. Recently, it has also been shown that the fiber used in the TightRope Procedure usually breaks in about 5-6 weeks due to friction as it moves in the bony canals of the Femur and Tibia. 7. What are the pros and cons to the TPLO procedure? The TPLO procedure is a patented procedure that is designed to alter the slope of the Tibial Plateau. As previously mentioned, the Tibial Plateau has a downward slope to it. The advocates of this procedure claim that excessive slopes are the cause of the rupture of the cruciate ligament. Unfortunately, research has not backed this up. Research into the Tibial Plateau Angles (TPA) of both dogs and wolves, has shown that the degree of the TPA has not been correlated with rupture of the ligament. Therefore, would changing that angle be the appropriate surgery? That question is currently being actively debated. During this surgery, the top of the tibia (the weight bearing surface) is cut and rotated a few degrees to decrease the slope of the Tibial Plateau. This cut bone is then re-attached with a heavy duty stainless steel plate and numerous screws. Stainless Steel is not considered "bone friendly" and may, in some cases, cause continual irritation to the bone. It has also been shown that some additional arthritis does still occur after surgery, indicating that there may still be some abnormal motion in the leg. A search of the literature indicates that some abnormal motion may still remain in the form of a Pivot Shift. This is a tendancy for the lower portion of the leg to turn inwards. Interested readers can look up Pivot Shift on any search engine to read further. Some of these dogs seem to be in discomfort in cold weather. It is possibly the thick Stainless Steel plate that is responsible. Since the cut made into the bone is on the weight bearing surface of the tibia, the use of a thick plate is essential to help the two bones heal back together. 8. What are the pros and cons of the TTA Procedure? The TTA or Tibial Tuberosity Advancement Procedure is based on the research that the Patellar Ligament can stabilize the joint if it is at a 90 degree angle to the Tibial Plateau. The Patellar Ligament is one of the toughest ligaments in the body, and it is completely controlled by one of the biggest muscles in the body, the quadriceps muscle on the front of the leg. By advancing the Tibial Tuberosity, we can overcome the abnormal front to back motion called Tibial Thrust, and also tend to overcome the tendance for Pivot Shift. Current thought is that this procedure leads to less arthritic change in the joint. This procedure can be successfully done on any size dog, and is currently the treatment of choice by many surgeons. At present, the TTA-2 is only offered on dogs over 40 lbs. The TTA is available on any size dog! 9. What are the pros and cons of the Ruby Procedure? The Ruby procedure is new, but extremely promising. The bone anchor that is used is very compatible with bone and extremely strong. The fibers that are used are Ultra-High Molecular Weight Polyethylene - known as Dyneema. This fiber is extremely strong, does not stretch, and the only surface that this fiber moves against is a polished ruby within the bone anchor. The bone anchors are placed in very special spots on the tibia and the femur, which allows for good stabilization of the joint, without overly compressing the cartilages. This stabilization allows for good range of motion. The combination of the Dyneema and the ruby lining the bone anchor should allow for extremely long life span of the stabilization. At present, this procedure is only available for medium size dogs. 10. Why do some surgeons continue to do TPLO surgeries when the TTA has been shown to be a better procedure? There are several answers to this question, First, it is not universally accepted that one procedure is better than another. It appears that the TTA procedure will be the best procedure available, but we will know for sure twenty years from now! The second reason is possibly a matter of training. The TPLO procedure was a patented procedure. To be certified, the surgeon had to take special classes given by the company who owns the patent. The surgery requires the purchase of very specialized equipment, and consequently, a fair amount of investment has been made on the part of the surgeon. It is quite hard to give up a procedure that you have invested time and money in, particularly when the jury may still be out on the eventual winner of this "contest" between surgeries. A third reason is that most of the TPLO surgeons report "good" results. The fact the TTA research looks better than the TPLO does not mean that the TPLO surgery is wrong. Similarly, surgeons doing many of the older procedures for cruciate repair also reported good results. As I have mentioned, twenty years from now , the results will be more evident. 11. Is the TTA procedure only for large breed dogs? The TTA procedure can be successfully performed on almost any size dog. Implants are made for dogs as small as 8 lbs to dogs over 120 lbs. 12. How is the bone cut and the necessary plates different between the TTA and the TPLO procedure? In the TPLO procedure the cut is made in the weight bearing area of the tibia and consequently requires a larger thicker plate for its stabilization. This cut on the weight bearing surface causes significantly more pain in the initial healing stages. In the TTA procedure the cut is made in a non-weight bearing area of the bone. In the TTA procedure, all of the implants (that are used by this surgeon) are made of space age Titanium. The implants are consequently thinner, lighter, and stronger than stainless steel. 13. I have been told that my dog may have the same problem later on the opposite leg. Is this true? The statistics tell us that 50-60% of the dogs will suffer rupture of the cruciate ligament in the opposite leg. It is probable that the underlying arthritic change that lead to the first rupture has already started in the opposite leg. 14. What can I do to lower the chance that my dog will need surgery in the opposite leg? There are several things that may help. Obesity is often blamed as one contributing factor. So, if your dog is overweight, then a proper diet program may help. If you are not sure if your dog is overweight, ask your doctor. Most veterinarians will give your dog a "body condition score" and explain what that means. Your doctor will also give you suggestions to help your dog lose weight. Many dogs act like "weekend cowboys". They rest all week and on the weekends, when the parents are home, they over exercise in the back yard, possibly leading to joint damage. The same thing frequently happens to people. It is important that our muscles be trained for the activities that we plan to do. It is important also to stretch our muscles before vigorous workouts. Talk to your doctor about how you can help train your dog, rather than just turn him or her loose. Since degenerative changes in the knee can lead to ligament damage, it is appropriate for all patients to use a good quality Joint Supplement and a good source of Omega-3 Fatty Acids to try to reduce the severity of additional arthritic change. 15. What can I do to possibly speed up my dog's recovery? Most dogs that have any type of knee surgery will benefit by the use of ice packs during the initial recovery period and for about 7-10 days thereafter. Ice will be used here in the hospital immediately after surgery and several additional times before your pet goes home. Additionally, a new modality is now available for your dog called Laser Therapy. 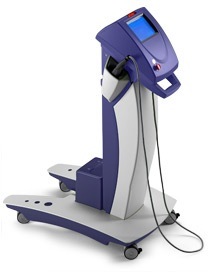 We have purchased a very expensive, state of the art MLS Laser Therapy unit. The treatments take 8 minutes and are directed at reducing postoperative swelling, postoperative edema, and pain. As a courtesy to our TTA patients, this therapy is automatically included in the immediate postoperative treatment. If you feel that your dog is uncomfortable and would like to schedule additional therapy sessions, you can do so with our receptionist. Ideally, therapy sessions are scheduled every other day for the first week, then twice a week for the second week, and then one session a week later. Use of the Assisi Loop can also reduce inflammation and speed recovery. Proper exercise with an Underwater Treadmill can build strength in the muscles that stabilize the knee joint.